Chances are, when you go in for a dental check-up or teeth cleaning, you get asked if you have been flossing regularly. While you may find this to be an annoyance, we ask because flossing is extremely important to maintaining a healthy mouth, and many people skip this step when taking care of their teeth. Brushing is absolutely part of a healthy mouth, but if you brush and don’t floss, it’s the equivalent of only washing 65% of your body. The rest is still dirty. Bacteria build up in stray food particles and plaque logged between your teeth and around your gums. By flossing, you can remove the plaque when it is still in its early stage: soft and malleable. Once it sits without moving for a period of time, however, it turns into tartar, a hard substance which can only be removed by a professional. If left untreated, the bacteria in the tartar will build up and produce toxins that inflame the gums, known as gingivitis. Furthermore, this can move on to become periodontal disease where the infection spreads to the bones and tooth structure, promoting bone loss, loose teeth, and even loss of teeth. Bacteria also give off acid, which eats away at your teeth and leaves cavities, and sulfur compounds that produce bad breath. 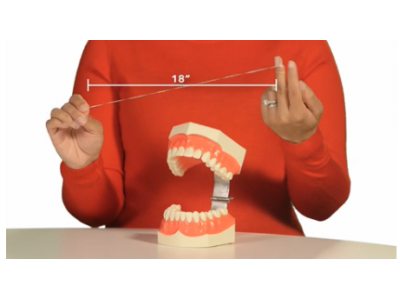 Dentists and the American Dental Association recommend flossing once a day along with brushing twice a day. Many people may wonder what the best time of day to floss is, but the important thing is just to make sure you do it. Some may prefer to do it first thing in the morning to get it out of the way while others may prefer to do it after lunch or right before bed to sleep with a clean mouth. Flossing before brushing allows for the fluoride in toothpaste to better reach between teeth and around gums. And just as it’s important for you to floss, it’s important that you floss your children’s teeth, too. Children under ten years of age may have difficulty handling floss. You should start flossing your children’s teeth as soon as they grow two teeth that touch.